Monthly field trips, held the second Saturday of the month, provide wonderful outdoor experiences for Des Moines Audubon members and guests. Not only are these opportunities to see some good birds, they are also times of socializing with people who enjoy the same things that you do. Destinations are selected based on the likelihood of finding a nice selection of species for the time of year. Although many of the destiinations are within close proximity of Des Moines proper, a few may venture outside the county. 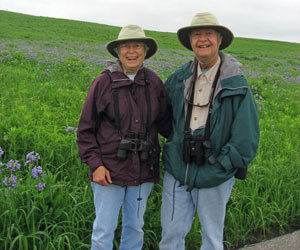 Beginners are very welcome and this is a great way to improve your birding skills by joining a wide range of birders. Check the details below for the next field trip location, meet the group at the meeting place for car-pooling, grab your binoculars and bird book, and be sure to pack a few of those fresh-baked cookies to share with your friends!